Whether you’re selling your farm or just looking to reduce the amount of equipment you have, a farm equipment auction is a great way to sell your farm equipment. Just like selling a house or a car, there are ways that you can improve your chances of selling all of your equipment and getting the best price. If you are ready to sell equipment from your southeast Michigan farm, here are some suggestions for getting the most out of your Michigan farm equipment auction. Just like selling a home, you are going to want to do some work on your equipment before you put it up for sale. It doesn’t have to be perfect, but taking the time to clean up what you can, will make a big difference in the price you can get for your equipment. Yes, this may mean that you spend a little money to have equipment serviced, painted, or to replace missing parts. However, the price you get for a piece of equipment that looks well cared for can cover the cost of your repairs and more. Tractors, combines, trucks and small vehicles such as lawn mowers or ATVs should run, if possible. A working piece of equipment will bring a better price than one that the buyer will have to fix. If your equipment is not repairable, make sure that you let your auctioneer know this, so that they can list the item as “for parts only.” While this isn’t going to get you the best price, there are buyers that look for equipment for their parts. Listing an item for parts will get you a lower price, but your buyers won’t be surprised by something that doesn’t work. 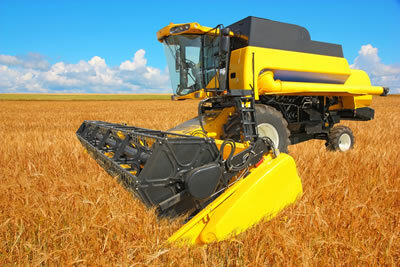 Make sure that you hire the right Michigan farm equipment auctioneer for your sale. Not all auctioneers are experienced with farm equipment and may not be able to help you properly appraise and price your equipment. Some auctioneers have higher fees and may take more from the auction than others. You should always ask a potential auctioneer what their fees are, and how they apply them. You may feel more comfortable paying an up-front fee instead of a percentage of sales. Doing some research beforehand will ensure that you hire the right person or auction company for the job. Get the word out! The best way to make the most of your farm equipment auction is to advertise, advertise, advertise. The more people that know about your auction, the more likely you are to sell your equipment and get a good price for it. This also means that you should hire an auctioneer that knows all of the best ways to advertise. Today, it’s not enough to advertise in the newspaper and hang fliers. The internet is a great tool for advertising auctions and equipment sales. When you are planning your auction, make sure that your Michigan auction company uses print, internet and social media to advertise your sale. If you’re looking to sell farm equipment or are looking to buy farm equipment by auctions, Gary M. Berry, Michigan Real Estate Auctioneer is your southeast Michigan auction expert. For more information on our services, or to start planning your own auction, please call us today at (248) 299-5959.